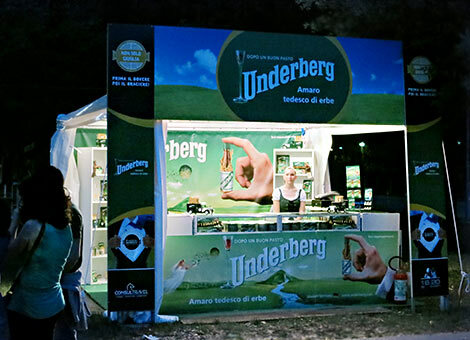 Editor’s Note: From the Umbrian city of Perugia, we already reported about the unique annual “Eurochocolate” event. Now Perugia also seems to earn the title as Italy’s barbecue capital. Already in its second year, the city hosted a ten day long event named “Piacere Barbecue”, which translates to joy of grilling. It went on from June 6 to June 15, 2014. And a lot of joy it was. 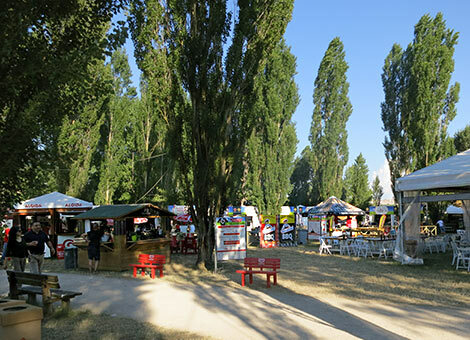 Already in its first year, Piacere Barbecue attracted 55,000 visitors. Here’s Harald’s report from the 2014 event. 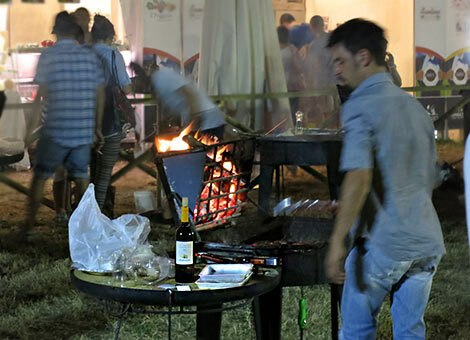 The grilling festival took place on the Percorso Verde di Pian di Massiano , a park with lots of sports activities and only 10 minutes driving distance from the city. Lots of free parking, and no admittance fee – nice! When arriving at the park, it is evident that this event is huge. Exploring Piacere Barbecue easily takes a couple of hours. So where do we start. Lets begin with barbecuer’s fuel – charcoal. 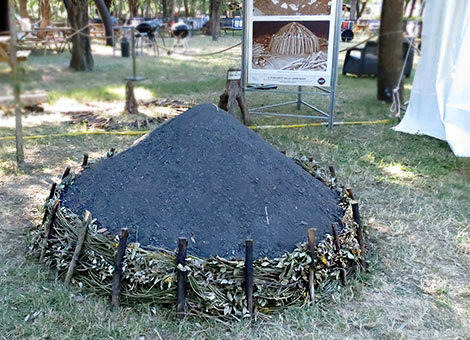 There’s a demonstration of how charcoal is made, something most of us will probably see for the first time. 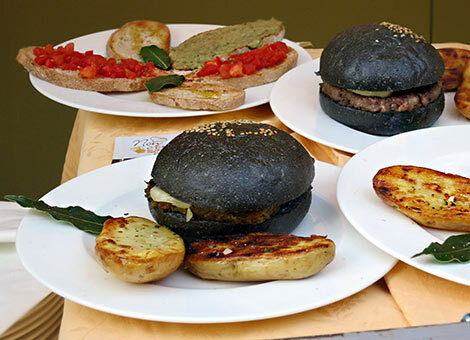 Even with gas grills becoming quite popular in Italy, charcoal grills are the most popular ones. Many homeowners have a griglia muratura in their yard, a solid grill made of bricks and mortar. 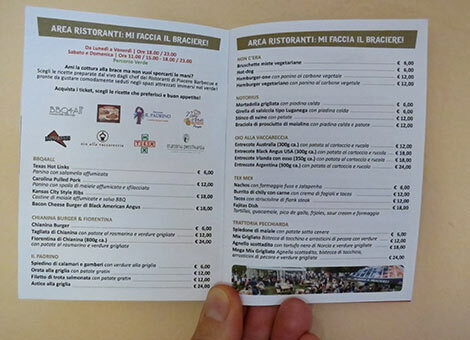 Option #1: “Mi Faccia il Braciere” (“Get me something off the Grill”) – Many booths were offering prepared dishes, all grilled to perfection. 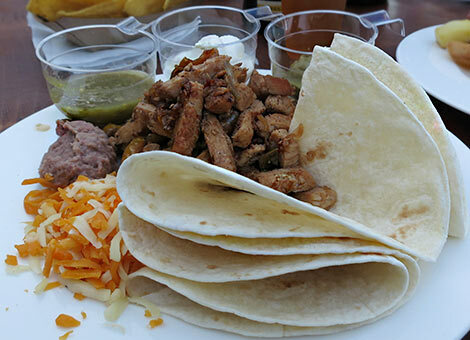 Choices included fiorentina (the t-bone steak from the wonderful Chianina cattle), burgers, pulled pork, ribs, Texmex classics, seafood and much more. 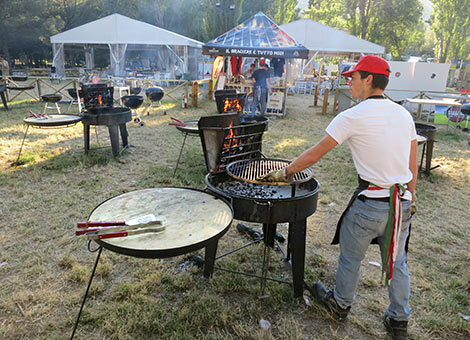 These dishes were grilled and offerered by various regional restaurants, as well as “BBQ4All”, the leading Italian association of grill lovers (Motto: “American Skills, Italian Style”). BBQ4All also has a Website with forums, recipes and shopping, and they organize barbecue events and classes (see Web links). BBQ4All and local restaurants offered a huge range of barbecue specialties. 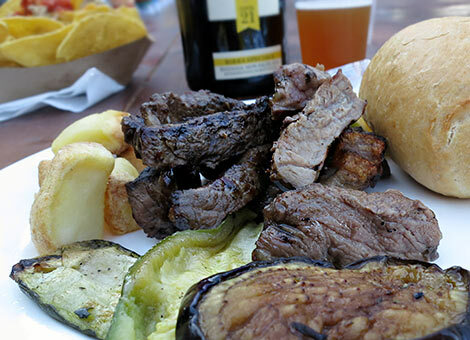 Chianina beef strips with grilled Mediterranwan veggies. 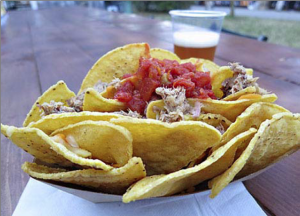 Nachos with pulled pork, tasty salsa and jalapeno rings. 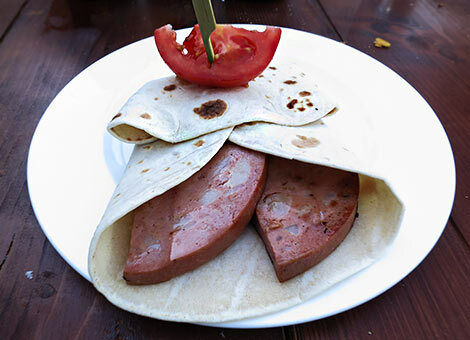 TexMex meets Italy: Grilled Mortadella sausage. Yep, Mortadella! We would have loved to sample the Kansas City Style Ribs, but these were already sold out early that night. Tells you something! 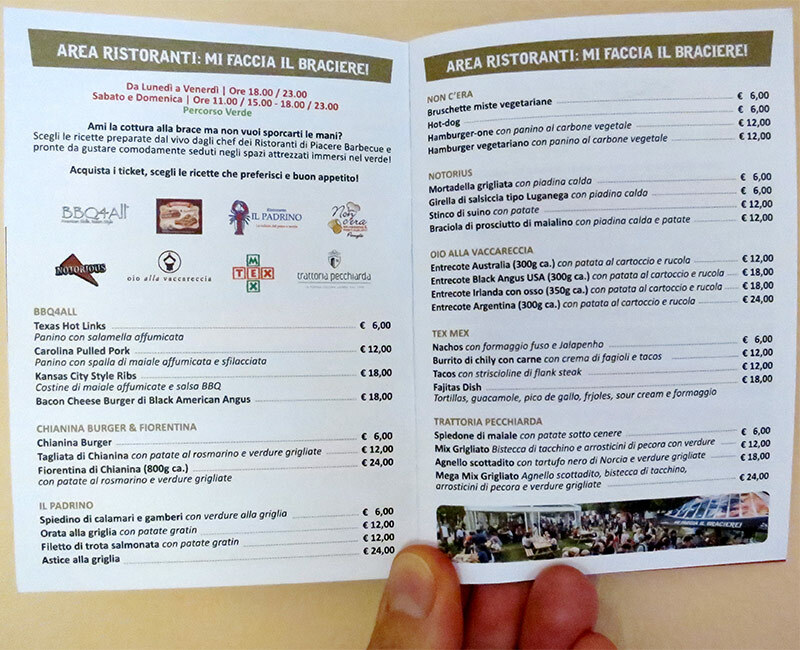 The organizers produced a handy little catalog with all events, classes, and also the menu options one would find at the various booths. Menu pages in the Piacere Barbecue catalog. Click here for a larger image. 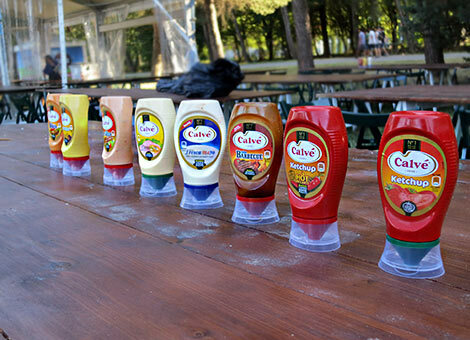 The target group of Italian grillers is obviously big enough to attract larger sponsors, like Calvé, a brand owned by Unilever. The product range includes ketchup, mustard, mayo, as well as various sauces suitable also for grilling. All tables were generously equipped with the products. Generous sponsoring with grill-compatible Calvé products. 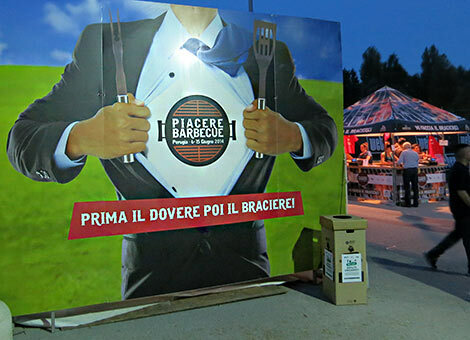 Option #2: “Il Braciere è tutto mio” (“The Grill is all Mine”) – Those who preferred to grill their food themselves could purchaase almost everything you can throw on the barbie at vendor booths nearby. Options included perfectly cut steaks from the region as well as from the USA, Ireland, Argentina and Australia, also other meats, sausages, veggies, cheese and breads. 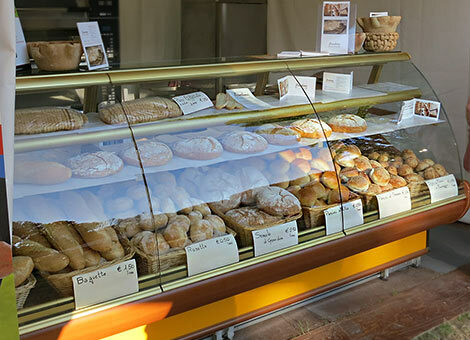 Seafood lovers found shrimps, squid and fish from the ocean as well as from the nearby Lago Trasimeno (when visiting Piacere Barbecue next year, be sure make a stop at that wonderful lake and take the little ferryboat to the island within). Then there was a fired-up grill waiting to cook the purchased goodies. Already in the afternoon helpers started the fire on a huge number of grills so at night grillers could start right away. Personnel heated up grills for DIY barbecuers. A nice bread selection made the offering complete. Shortly after dark, all grills were occupied, even on a Monday night. Besides a few Weber kettles (the grill manufacturer was the main sponsor), another piece of grilling hardware dominated the scene that we found quite interesting: Behind a vertical grid, huge wood logs were burned, and thanks to gravity, the ember would fall into the base below the adjustable grate almost by itself. In the foreground on the picture below, you can see the wood supply. Up in smoke: grilling the foods purchased at the booths. Working hard at the grill doesn’t mean you can’t go ahead and enjoy a little beverage. Who would blame the young fella?! The DIY grillers had a lot of fun! 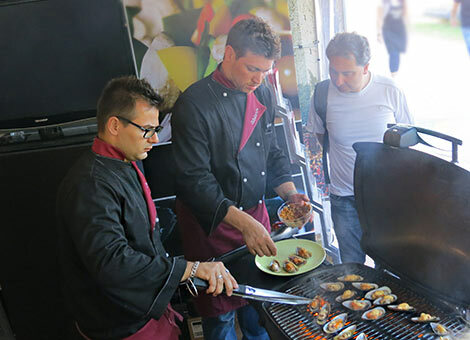 Option #3: “VIP Grill” (Rent a grill chef) – Those who like to personally select the meats and stuff but don’t want to get their hands dirty could hire a chef who would grill the purchased goodies to perfection, for the more than fair fee of 8 Euro (about 11 US$). But isn’t standing at the grill part of the fun? Anyway, we thought it was a neat idea to offer this “VIP service” as well. No matter whether menu items purchased at the booths, self service or “contract grilling” — plenty of space was provided to enjoy the grilled goodies. 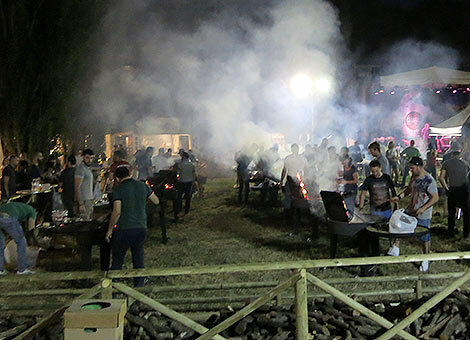 In general, the Piacere Barbecue event was organized extremely well. 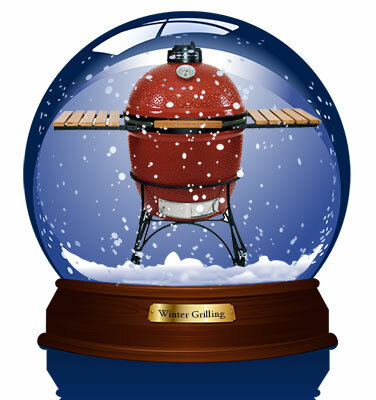 Plenty of space to enjoy the grilled goodies. No barbecue event would be complete without a decent beverage offering. The region of Umbria produces wonderful wines (watch out, Tuscany! ), a nice match for food off the grill. And beer can’t miss either, of course. 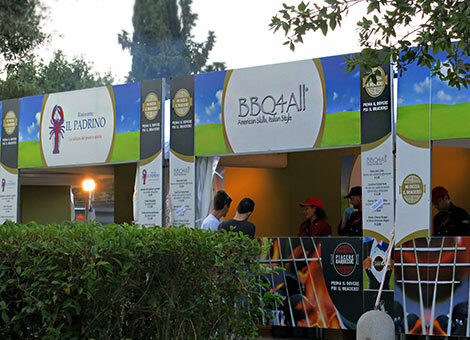 One of the Piacere Barbecue sponsors was Peroni, a major Italian beer maker who offered the brew on tap. Besides the big manufacturers, there’s also a growing number of smaller beer makers and even micro breweries in Italy these days. In fact, for me as a German now living in Italy, it is almost a little embarassing that this country, better known for its excellent wines, has a much more lively micro brew scene with superb products than my homeland, famous for its beer. I was glad that one of my Italian favorites was here, Mastri Birrai Umbri — besides dark and blonde, they make a tasty unfiltered Rosso that’s fermented in the bottle. Yum! 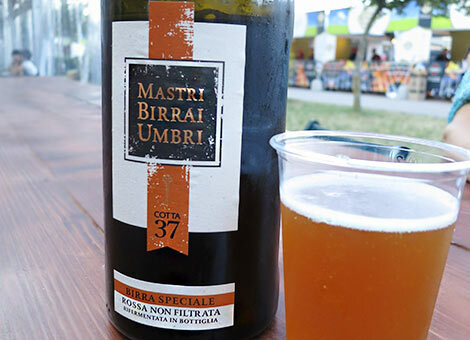 Not cheap, but tasty: The unfiltered Umbrian Rossa. At a bar booth, caipirinha and other cocktails were mixed. Plenty of non-alkoholic drinks were available as well. Very important, as penalties for drunk driving are severe in Italy (and IMHO, that’s all right – each DUI victim is one too many). Desserts weren’t missing either – if there was still room in the stomach, one booth served goodies like macedonia (fruit salad), ice cream or crepes, the latter also gluten free (currently a big ticket in Italy). “Amaro tedesco di erbe”: German herbal bitter in Italy. Various cooking demos got barbecue newbies started and taught old dogs new tricks. These were also provided by the BBQ4All experts. Here’s Alessandro Muscas (left), a Certified Barbeque Judge & Certified Table Captain at The Kansas City Barbeque Society and Coach & Grill Master at BBQ4All — he demonstrated how to grill mussels. The opened mussels were quickly cooked over direct heat with a little bit of salted butter added that Allessandro had spiced up with chipotle in adobo sauce. As a finish, his collegue topped the mussels with breadcrumbs toasted in olive oil with a little garlic. The result was really tasty, and we’ll definitely try that at home. Mussels on the grill with spiced butter and crispy breadcrumbs. The teaching lessons also included scientific background for barbecuers. For example, the presentation “La carne al microscopio” showed meat structure under the microscope. Understanding how meat is made up of fibers can help obtaining better grilling results. Who would have thought that you can learn so much useful stuff at a barbecue event! 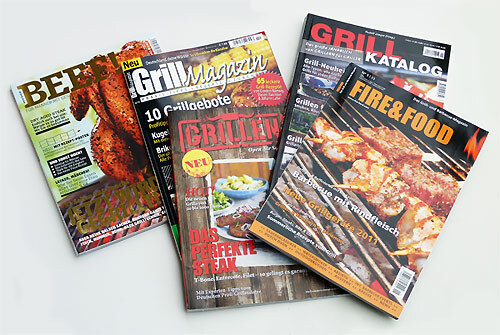 Grill enthusiasts were also glad to find various vendors of barbecue hardware and accessories. Main Piacere Barbecue sponsor was US manufacturer Weber. There’s basically no home improvement store or garden center here in Italy these days without an extensive barbecue department, dominated by Weber products. That’s great, as this big company has the power to build the market and make barbecueing even more popular among Italians. 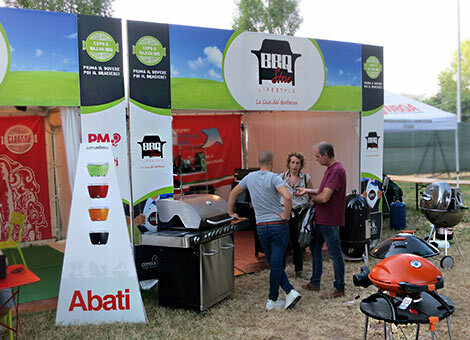 Besides the well-known kettle grills and other Weber products, there were also grills and outdoor baking ovens from Italian manufacturers on display, and we spotted some interesting and unique products. 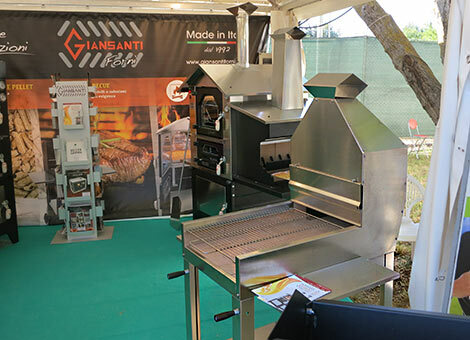 Nifty barbecue and baking hardware made in Italy. With the growing popularity of barbecue in Italy, a whole bunch of dedicated shops is popping up here, both on the Web and brick & mortar. One of them, “BBQ Store” had a nice hardware selection on display. Our Italian friends Luisa and Maurizio were amazed at the BBQ Store’s selection. Those who wanted to improve their skills were able to sign up for various grilling classes. And for the first time, this year Piacere Barbecue hosted a barbecue contest sanctioned by the Kansas City Barbeque Society (KCBS), a nonprofit organization dedicated to promoting and enjoying barbeque (according to KCBS, this is the world’s largest organization of barbeque and grilling enthusiasts with over 15,000 members worldwide). As if all the grilling excitement wasn’t enough entertainment, the organzizers also provided a professional stage. An interesting mix of live acts provided something for everyone — Brazilian rhythms, folklore, a Beatles coverband, and one DJ served up an 80’s and 90’s mix. 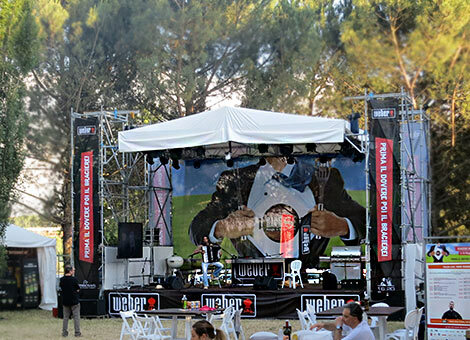 A stage hosted single entertainers, DJs, folklore and even a Beatles coverband. 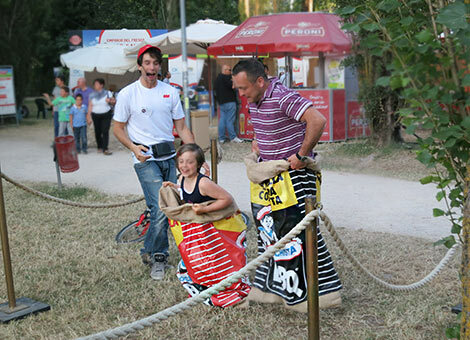 Among the barbecue related attractions for the young and old was also sack race, provided by a charcoal manufacturer. The sacks of choice were – of course! – huge empty charcoal bags. Sack racing with empty charcoal bags. Hopefully not used ones! 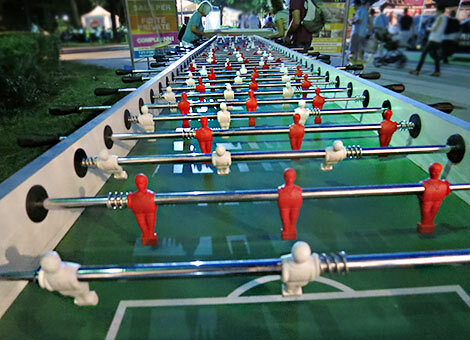 Kafkaesque: The longest table soccer in the world. Even on a Monday night there was plenty of traffic at Piacere Barbecue. 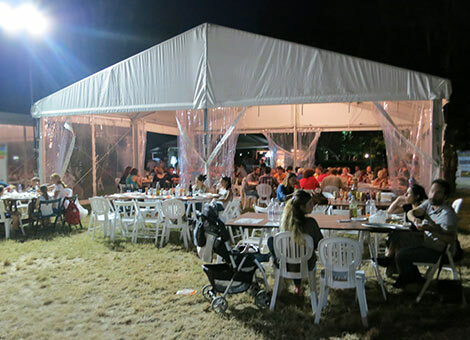 Piacere Barbecue – The name is more than adequate for this event. 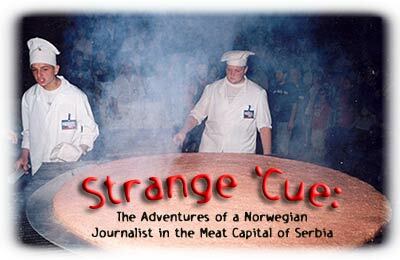 In the United States we’ve visited interesting events like barbecue competitions, Ribfest. But neither in the BBQ country USA nor anywhere else we’ve seen any barbecue event as huge and versatile as Piacere Barbecue. Plus, the whole thing was well-organized and well-styled. 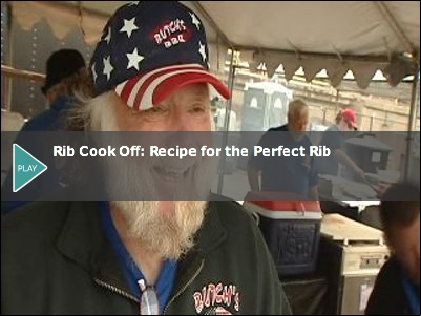 According to the organizers, 60,000 people attended Piacere Barbecue 2014. 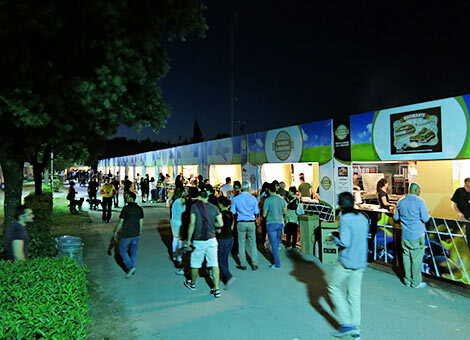 In 2013, the first year of the event, there were 55,000 visitors. 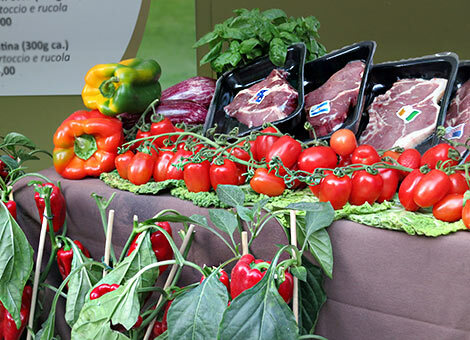 5000 do-it-yourself BBQers alone grilled 2000 kg meat, 500 kg fish, 400 kg veggies and 100 kg cheese. Also, 350 liters extra virgin olive oil were used (remember, this is Italy). Consumption and attendance are sure to climb in upcoming years, also because of the KCBS competition involvement. Rain or shine: Piacere Barbecue 2015 is already on our travel agenda. And next time, we’ll stay a few days, as catching it all in one night is nearly impossible. We’ll be baaaaack….